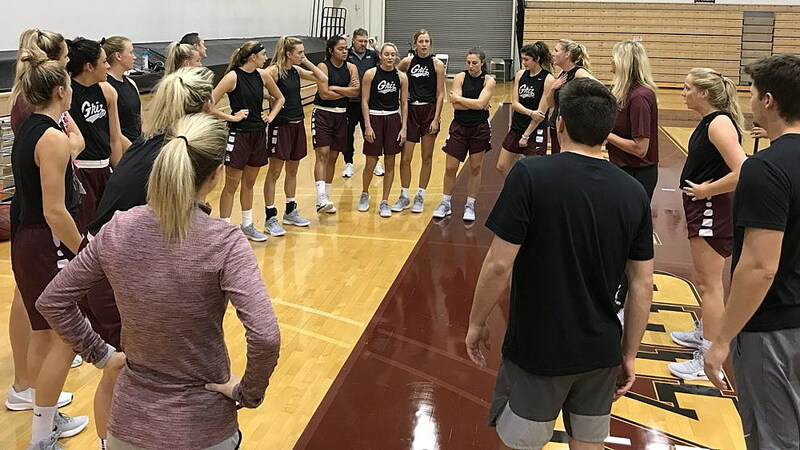 The 2018-19 Montana women’s basketball team, already the third for head coach Shannon Schweyen, will make its public debut on Tuesday when the program holds its annual Maroon-Silver scrimmage at Dahlberg Arena. The women’s scrimmage starts at 5:30 p.m. The men’s Maroon-Silver scrimmage will follow at 7 p.m. Both are free of charge to the public. Montana, which is coming off a 14-17 season, double the wins total from Schweyen’s first year after replacing Robin Selvig, was picked fifth in the Big Sky Conference preseason coaches’ poll that was released last week. The Lady Griz were seventh in the media poll. Montana will play its lone preseason exhibition game when it hosts Carroll on Tuesday, Oct. 30, at 7 p.m. The team’s regular-season opener will be at Gonzaga on Wednesday, Nov. 7. 1. Two years ago, in the lead-up to Schweyen’s first Maroon-Silver scrimmage as head coach, the program was still reeling from the early-October loss of Kayleigh Valley, who had been voted the Big Sky Conference Preseason MVP but was lost for the year with a knee injury. Last season Valley did it again, repeating the same injury to the same knee. That news was followed just days later by the announcement that Alycia (Sims) Harris was medically retiring. This year? Outside of Sophia Stiles and the knee injury she suffered in early February and continues to rehab, the Lady Griz, outside of a missed practice here and there for relatively minor ailments, remain mostly healthy. If these things go in cycles, Montana should be due for, what, perhaps a decade of good fortune? That would get us to the 2028-29 season. Valley alone should be worth that much in payback. “It’s been encouraging. It seems there is always something with somebody most days, but for the most part the majority of them have been out there every day,” said Schweyen. 2. Stiles has been practicing on a limited basis, but she won’t be playing on Tuesday. She’s not to that point yet. The team’s other 13 players are expected to be ready to go. That includes transfer Sammy Fatkin, and Tuesday will be your only chance to see her until next October, when she’ll be a redshirt sophomore. She’ll be sitting this season out after transferring from Arizona. Montana was one of her finalists when she came out of Glacier Peak High in Snohomish, Wash., but she chose the Wildcats. She played in 28 games as a true freshman last winter before making the move to Missoula after the spring semester. She is generously listed at 5-foot-11, which might be a stretch, but she plays like it, gifted as she was with long limbs. She is a point guard at heart but has the skills to play the 2 or the 3 as well. And while the team could really use it now, for this season, she can be a threat from 3-point range. She scored 11 points against San Diego State last season, going 3 for 5 from the arc. This year she is the only player to reach perfection in one of the team’s usual shooting drills. Where Fatkin could really make her mark is on the defensive end. In a league that is full of good — and good-sized — guards and teams that more and more are reliant on the 3-point shot, having a perimeter defender with size can only be beneficial. 3. Montana has four true freshmen — Kylie Frohlich and Jordyn Schweyen of Missoula, Carmen Gfeller of Colfax, Wash., and Katie Mayhue of Albany, Ore — and some of them will redshirt this coming season. Who those players are has yet to be determined. See them all on Tuesday, some for the only time this season. 4. One of the freshmen who most definitely will not be redshirting will be Mayhue. She is ready to play right now. As in right now, this very instant. Call her and say there is an open gym, a ball and some players, and she’ll drop everything and be there. She was a Pac-12 commit before that fell through about a year ago, and Montana was her landing spot, a program with an opening for a player needing a home. Call it a win-win. She’s been scoring it at the team’s prior scrimmages, pouring in 20 points in the first, going 4 for 7 from 3-point range, and adding 21 more in the most recent scrimmage. Of the newcomers, she’s the one you’ll look to the person next to you and ask, “She’s a freshman?” She just plays with a confidence not always seen in first-year players. “She’s an exciting player to watch,” said Schweyen. “It’s been nice to see someone consistently shoot the three. That’s been nice. But she can also get to the hole. If there’s a knock on Mayhue it’s that she has a bit of showmanship to her game. Perhaps too much at times. We all love the occasional behind-the-back pass on the break from McKenzie Johnston, but she picks her spots. Mayhue plays with such love for the game that she wants to present that as a gift to you every time you see her play, like it’s her obligation to entertain you. It’s a balancing act that will take time to get just right. Schweyen doesn’t want to suppress it, but she also acknowledges that the simple two-handed chest pass can never be the wrong option. “She sometimes makes the fancy pass instead of the fundamental pass, but she’s learning a lot as she’s breaking into this, that things you can get away with in high school aren’t always the same in college,” said Schweyen. Then Mayhue pulls up on the break and swishes a 3-pointer and makes everything better. 5. Speaking of 3-point shooting, it’s a topic no one wanted to talk about the last two seasons, such a struggle it was for the Lady Griz. Two seasons ago, Montana shot 25.7 percent from the arc. Of the six players who took the most attempts that season, not one of them shot even 30 percent. For as hard as that team played, it was something that was always going to hold it back, like it was starting with a 10-point deficit before the game even started. As expected, everything about last year’s team was better. Except its 3-point shooting, which ended up at 27.5 percent. Better, but that still ranked 305th in the nation. For Montana to be good this winter, really good like it’s been in the past, it has to become better from the arc. And the players are there to do it. “That was a weakness for us the last two seasons and kind of the only area we didn’t make a lot of growth,” said Schweyen. It’s not the only way to win in the Big Sky Conference — there are only so many really good shooters out there after all — but Idaho, this year’s preseason favorite, ranked fifth in the nation in threes made last winter, and Northern Colorado ended Montana’s season in Reno with a barrage of early triples. For a balanced team like Montana, across players, from inside to outside, it could make all the difference. 6. When the teams get split up on Tuesday, go all in on whichever team redshirt junior point guard McKenzie Johnston is on for the win. That just seems to happen when she’s got the ball in her hands and there is some competition involved. “In practices and scrimmages and all the things we do, nine out of 10 times the team she’s on is going to win,” said Schweyen. Thank goodness for redshirt seasons. That means we get two more winters of Johnston leading the way. Did you know she was one assist from leading the Big Sky Conference in that category last winter? On a team she led in scoring? On a team that shot less than 40 percent for the season, less than 28 percent from 3-point range? Expect her scoring to remain where it was, at 12.5 points per game last season, if not go up one or two. Or more. But her assists? She’ll go from the 155 she had last season to more than 200 with some better team shooting. Because there were at least two knockdown shots per game last season that Johnston set up but watched rattle out. Johnston was left off the listing of All-Big Sky Conference players last season, only added as honorable mention after the fact. An oversight. Later that day she scored 28 points on 10-of-14 shooting as Montana defeated Sacramento State in the opening round of the Big Sky tournament in Reno. Two days later she had 23 points, six rebounds and six assists as Montana fell in the quarterfinals to Northern Colorado, the team that would go on to play in the NCAA Tournament. Hmmm, so she responds well to being overlooked, which she perhaps was when she didn’t make the six-player preseason All-Big Sky team. Let her season-long scorched-earth campaign begin. And let’s sit back and enjoy. 7. Tuesday will mark the return from redshirt purgatory of Gabi Harrington and the arrival of Abby Anderson, who used her redshirt season to begin a transformation. She’ll remind you of Carly Selvig — in length and in ability to change or swat shots — but with perhaps more upside to her offensive game. “She’s a true shot blocker. She is hard to score over in the paint. And she’s a good shooter and passer from the perimeter. She can knock down the 17 footer,” said Schweyen of a dying skill, sacrificed at the altar of those who want to either score at the rim or from the arc. Harrington should help not only with team’s perimeter shooting, she’ll add to things going on elsewhere, like on defense. That wasn’t the case two years ago, when she played as a true freshman and struggled to defend not her assigned player but within the team framework. “Redshirting was huge for both of those players,” said Schweyen. “Gabi made some growth, both in the weight room and also in understanding what we’re trying to do. 8. If you don’t know what last season was like for junior Madi Schoening, you can read this as a pre-scrimmage primer. Just be prepared to have a new favorite Lady Griz after you’ve read her story. So, yeah, she’s tough to an uncommon degree. And then there is the basketball side, a multi-purpose tool brought to life on the basketball court, someone who could play the point. Or the 2. Or the 3. Or the 4. And play all of them at game speed like it’s the only position she has been asked to learn. And not only the understanding but the skillset, because who can’t picture Schoening under the basket, powering her way through contact to finish? Or draining an open 3-point shot, which she did a team-high 31 times last season? She can play from one foot to 21, and everything in between. 9. Jace Henderson, the team’s lone senior, was one of the Big Sky Conference’s most improved players last season. She went from shooting 32.1 percent as a sophomore to 47.4 percent as a junior, and her averages jumped in proportion. Her scoring went from 2.7 points to 8.8, her rebounding from 3.1 to 7.2. But who can ever forget her closing line at the Big Sky tournament, not 15 minutes after Montana’s season had ended in a loss to Northern Colorado. “The culture we’ve built is pretty incredible. That’s something that’s going to be pretty scary in the future. I’m excited for it,” she said in Reno. She made sure the future didn’t start at some distant spot on the calendar but shortly after the team got back to Missoula. There wasn’t time to waste. The concern for Schweyen and her staff over the summer was a bit unusual. It didn’t have to do with concerns that their senior wasn’t doing enough. It was that she was doing too much. There was working out. There was open gym. There was work. And there are only so many hours in the day and amounts of energy one person can give to a program. But when the clock is ticking and you value that time so much, you do what you have to do to maximize the experience. 10. She lost her best player in her first year as head coach after 24 years as an assistant. It happened again last season. In the offseason she lost a handful more, each for her own reason, whether it was academics or the pull of family. Schweyen may have been a head coach for only two seasons, but they were two hard years, with more challenges than she ever faced as an assistant. They sped up the learning curve tenfold. So when you see her on the sideline on Tuesday, she’ll looked more relaxed. Not only because she is relieved at having made it through the preseason with her team mostly intact, she is just more prepared for what may come her way. “I’ve learned that everything you think your season might be can change tomorrow, in one little moment,” she said. “And if that moment happens, you have to move on. You have to pick up the pieces, reevaluate what you have and try to make the best of it. Now she has a team that can win. And win big, not something that could be said her first two years (though last year’s team got on a serious roll from late December to late January). It always felt like Montana could play with any team in the country. That feeling has gone away a bit. It’s what this year’s team will be trying to reintroduce into the program, starting in two weeks at Gonzaga. “I feel like if we can shoot the ball a little better, we can be a team that can play with anybody,” Schweyen said. “And this group is experienced enough that we can go in and defend people. And then there is this: since the late 70s, no four-year player at Montana has gone without a conference championship. The Big Sky is different now than it was, more balanced, more competitive and harder to win, but that doesn’t mean that streak has to end. It’s year No. 4 since the last title and NCAA trip. “It’s been amazing what we’ve done here in the past, with every player who has been here for four years winning a championship. That’s something they want to do and keep that streak alive and continue that tradition,” said Schweyen. And it all begins on Tuesday, as least for those wanting to watch and follow along. The invitation has been extended.